I'm a little burned out right now with the addition of all these extra tools to the Medeek Tools toolbar, but I still feel like I need to add one final addition to the mix. This one will be called the split tool and similar to the trim tool the user will select a single face (or three points, toggle with the control key?) to define a plane which will then be used to cut a solid group or component in two. The slightly tricky part with this is to make sure that the copied group/component is nested in the same overall group(s) as the original and retains all of its properties. This tool would be useful where you've used the followme tool to create some geometry but want to break the resulting solid into separate segments (groups). - Added the Split icon to the Medeek Tools toolbar. - Added the Split function for (solid) groups and components: split plane via one face or three points. When you first click on the tool it defaults to the user selecting a face for the cutting plane however if you hit the "CTRL" key in Windows it will toggle to the three point mode. - Addressed a bug in the Split function regarding nested groups and components. This is a critical fix for this tool. I strongly suggest that everyone upgrade from 2.2.6b to 2.2.6c. Let me know if there are any other tools that might come in handy with manipulating an architectural model. I think the six tools now available can cover most tasks but I'm sure I'm missing something. There has been some call for a tool that is similar to the split tool but rather than selecting just one face you would select two faces and a section could be removed from the solid object (imagine two infinite planes cutting a slice out of your solid object). I'm not exactly sure what to call this possible tool (section cut?). The other question is whether to have the tool break the solid into two separate groups or components like the split tool or just leave the resulting geometry as one group/component? I suppose I could always enable an option that would allow the user to toggle between these to behaviors offering some flexibility to the user. Similar to the split tool I could allow the user to define the cutting planes but either selecting two faces or selecting six points, or a combination of three points and a face or a face and three points. Lots of permutations here... just makes the code a little more fun. With regards to the cutting planes, they could be parallel or they might not be, it doesn't really matter. Just as I am doing in the split tool I will need to include logic that checks to see that the cutting planes actually do intersect the solids otherwise no action will be performed. The two cutting planes cannot be perpendicular to each otherwise a valid solution cannot be obtained, or at least that is what I initially thought. I will need to give that possible solution some more thought. If a solution can be obtained there is no reason to discard it. There may be some overlap with the Trim 2 function, but that tool does not have the ability to separate the solid into different groups. Any thoughts or suggestions with regard to this potential addition to the tools? Also just a reminder that even though I am including these tools within the Truss plugin they are designed to work with any solid geometry created in SketchUp, it doesn't need to be plugin related geometry. I've been thinking about labels for truss and rafter roofs and I would like to add in some sort of labeling system like the Wall plugin. 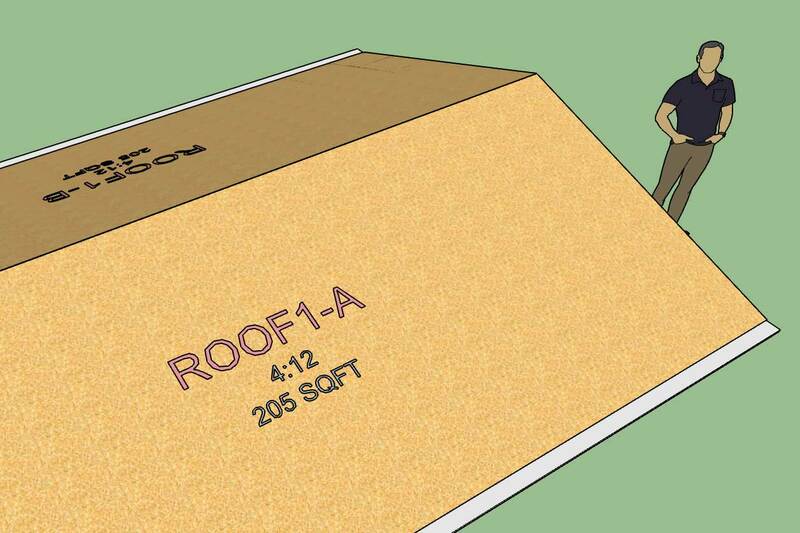 Each side will be designated a letter, so Roof1-A and Roof1-B. 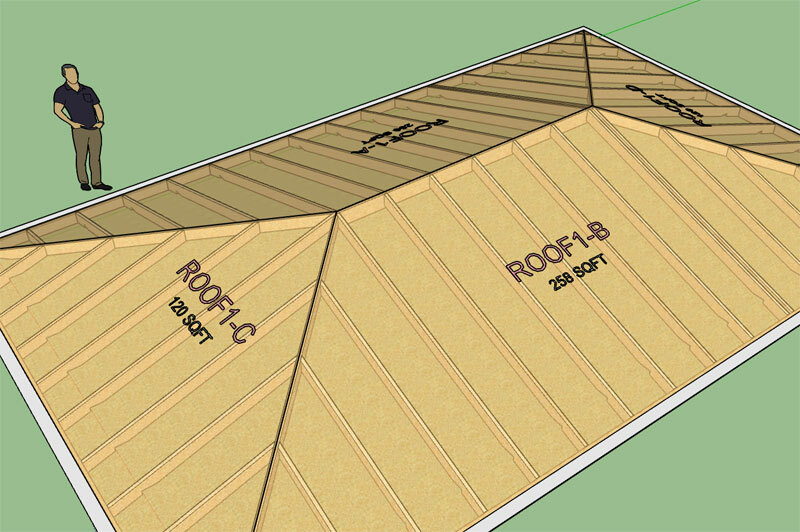 Hip roofs will have four roof planes so A, B, C and D.
- Roof and Floor labels option added to the General tab of the Global Settings. 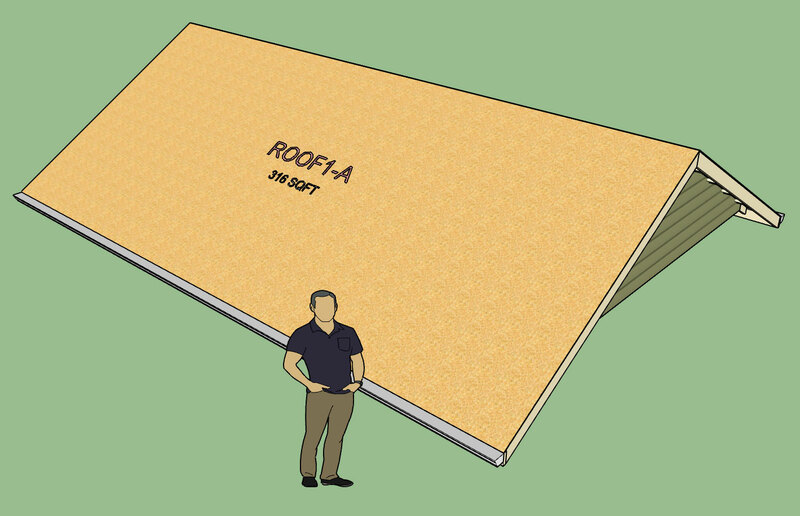 - Roof and Floor label prefixes can be customized in the General tab of the Global Settings. 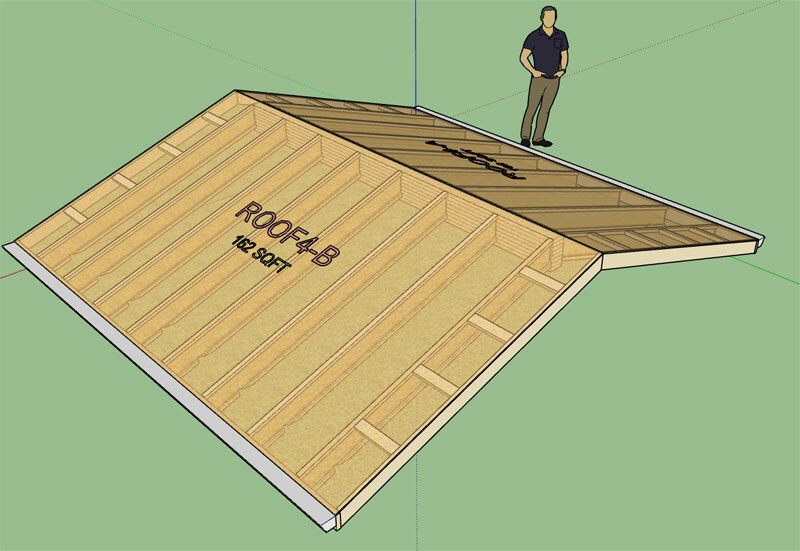 - Roof labels enabled for common trusses. 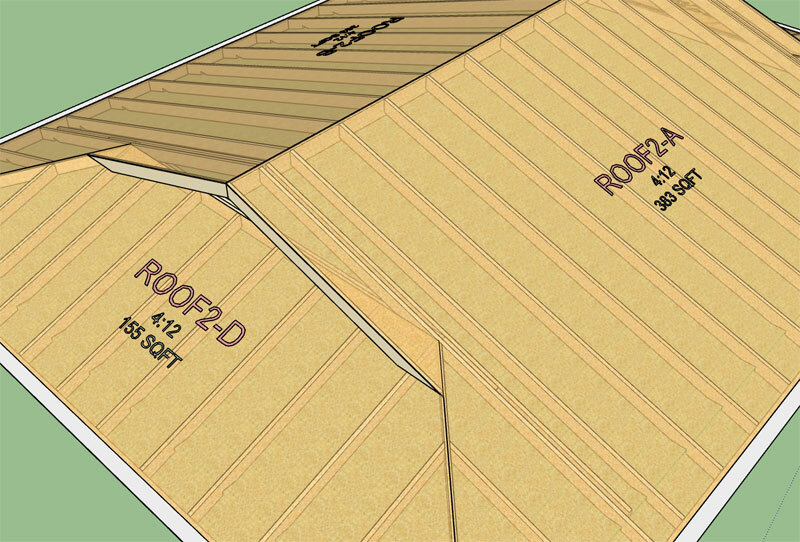 - When framing callouts are enabled the area of each roof plane will be shown below the roof label (currently only common truss assemblies have this feature available). - Added a customizable color for roof and floor labels within the Material tab of the Global Settings. - Added additional layers for dimensions, annotations, 2d geometry, building code and engineering. 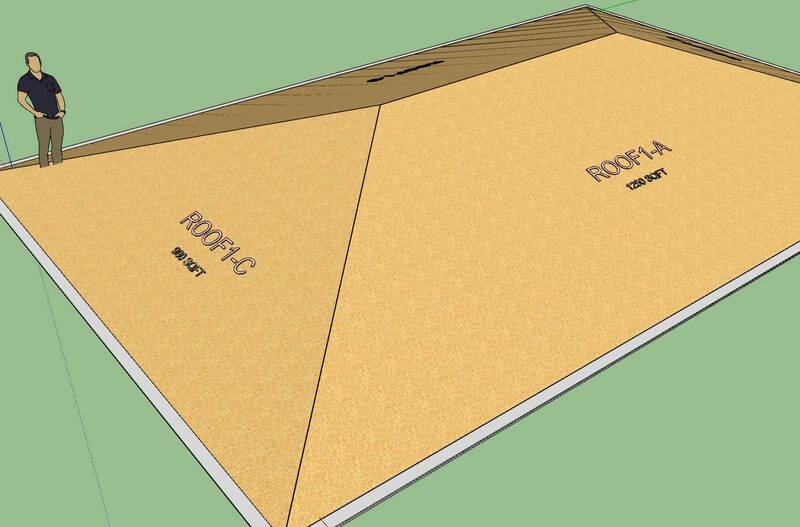 - Enabled roof labels and framing callouts for monopitch truss assemblies. - Added stats (roof sheathing) for common and monopitch truss roofs which can be analyzed within the Medeek Estimator (Wall Extension) module. In order to use this new feature you must also have the Wall plugin installed and upgraded to Version 0.9.9v, See Wall plugin thread for further details. 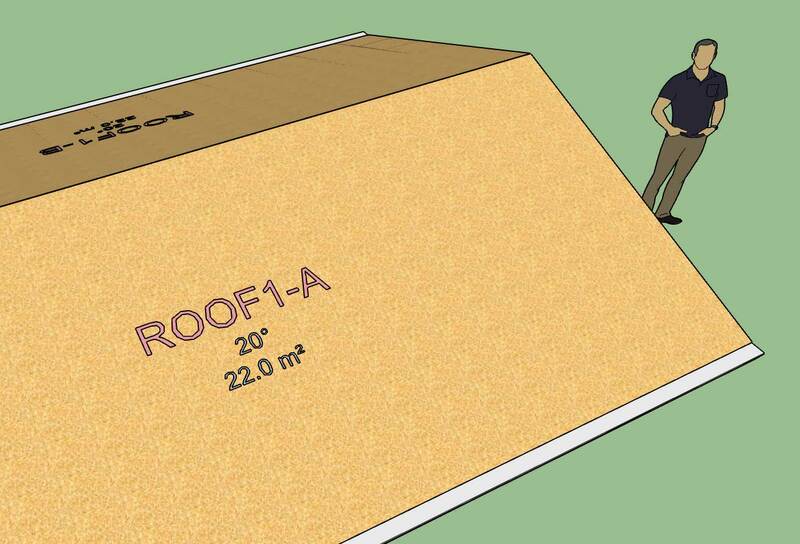 I've also been thinking about how to best handle holes or cutouts in the roof sheathing and cladding that are not only parametric but can be properly reported by the estimator (ie. net area vs. gross area). I think I have a system worked out, I just need to implement the prototype and test it out. The cut out or hole tool will have a few options. One of the options will allow the user to specify whether to cut the cladding, sheathing or framing or all of them. If the framing is cut then another option for framing in the opening. 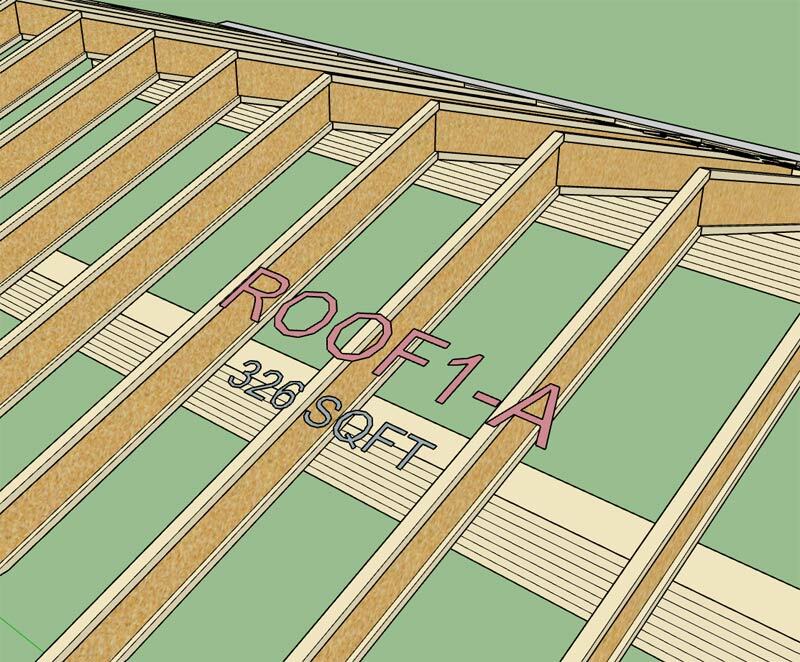 - All roof framing callouts now include the roof pitch or angle in degrees (metric templates). 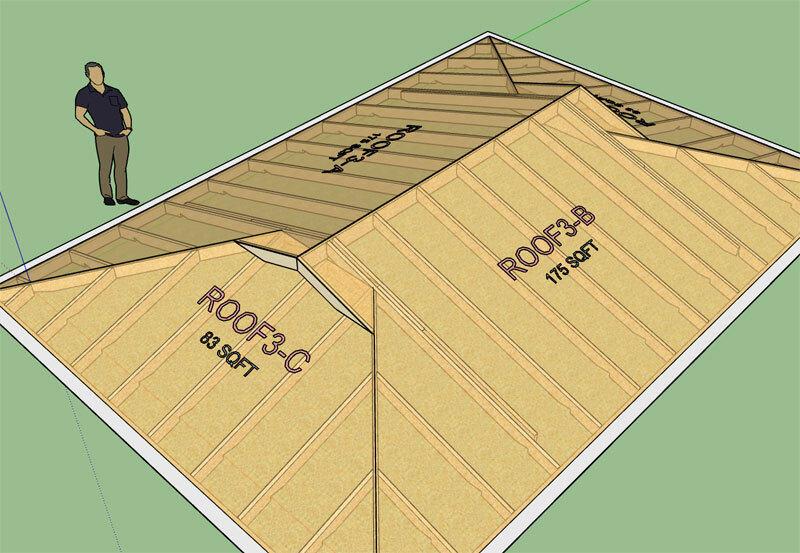 - Added additional stats: (ridge cap, drip edge) for common and (drip edge) for monopitch truss roofs which can be analyzed within the Medeek Estimator (Wall Extension) module. The new stats will become available with the next release of the Wall plugin. - License expiration date now appears in the License tab of the Global Settings when plugin is registered. - Fixed a bug in the license and registration module. I've noticed an issue with some licenses created in 2016. If you purchased a license before Jan. 2017 and the plugin is still showing as "TRIAL" version, even when the serial number is input properly into the License tab of the global settings, please contact me and I will re-issue you a corrected serial number as well as upgrade your expiration date by six months for any inconvenience this may have caused you. Draw Roof Truss tool has stopped working. I have not been able to duplicate this exact error yet however I did find a bug with regards to the upgrade I made about a month ago. In the resolution with this other issue I will extend the advanced menu for attic trusses so that it more closely mirrors the options found in the advanced menu for common trusses. - Fixed a bug in the display of the toolbars (Mac and Windows). - Enabled custom materials for wall sheathing, wall cladding, roof sheathing and roof cladding in the HTML advanced options draw menu for attic trusses. This update also resolved an associated bug in the global settings for attic trusses.